Are you looking for an English Essay with easy wording and on topic of Eids or Eidain then this page is about what you are looking for. 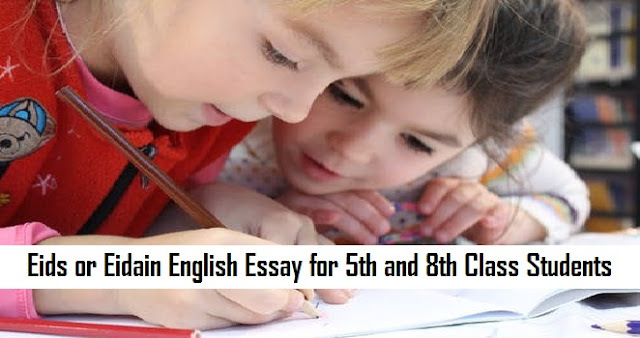 With this great and by teacher's note on Eids or Edain English Essay for primary and middle class students in Pakistan you can easily get good numbers. So read and download this Eids or Eidain Essay in English and impress your teachers or if you are teacher then recommend this great essay to your students for their bright future. Eid means "Joy". It brings joys and happiness in the lives of the Muslims. Muslims celebrate two Eids every year i.e. Eid-uI-Fitr and Eid-uI-Azha. One is celebrated in order to praise the glory of Allah on the completion of the holy month of Ramadan on 15t Shawwal. Children receive “Eidi” from their elders. The latter is celebrated in order to honour the great sacrifice given by the Prophet Ibrahim (A.S.). Eid-ul-Azha is celebrated on the 10th of Zilhij. Prosperous Muslims of the whole world give sacrifice of a goat, cow or a camel. Their meat is divided into three equal parts. One for the poor, one for the relatives and friends and the third is kept with us. Muslims also go to the holy city of Mecca in order to perform Hajj in this month. These are the two religious festivals that Muslims celebrate with traditional zeal and zest. If you need more essays in English for young students in Pakistan then stay connected with us and see related posts area too.